The ASSW (Arctic Science Summit Week) 2015 was successfully held from April 23 to 30, 2015 at the Toyama International Conference Center in Toyama, Japan with a total of 708 participants from 26 countries and region , under the auspices of IASC (International Arctic Science Committee) and co-organized by the Science Council of Japan. The ASSW is the largest annual Arctic Science Meeting in the world, and this was the first time it was held in Japan. During the first 4 days, committee meetings of IASC and other Arctic organizations were held to discuss ongoing and new research projects, as well as the role of Arctic science in society, science priorities for the coming decade and new strategies to promote international cooperation. On April 26, a public lecture titled “Arctic came to Toyama!” was held and nearly 500 attendees including people from the near-by prefectures. IASC President Susan Barr, geophysicist Shun Akasofu and photographer Naoki Ishikawa delivered a talk, and afterwards specialists on snow and ice of Arctic and Toyama convened a panel discussion. During the final 4 days, joint sessions of ICARPIII (International Conference on Arctic Research Planning) and ISAR-4 (International Symposium on Arctic Research) were held. The Honorary Chairperson of the ASSW2015, Her Imperial Highness Princess Takamado attended the plenary session on the first day, and spoke of her hopes for Arctic research. Also, a message from Prime Minister Shinzo Abe was presented. During the 26 scientific sessions, there were many presentations and much discussion about Arctic natural science as well as human and social science. At the end, the ASSW2015 Conference Statement, outlining the future direction of Arctic research was announced. The next ASSW will be held in March 2016 at Fairbanks, Alaska. The Arctic Science Summit Week (ASSW) is the annual gathering of the international organizations engaged in supporting and facilitating Arctic research. The purpose of the summit is to provide opportunities for coordination, collaboration and cooperation in all areas of Arctic science. The summit attracts scientists, students, policy makers and other professionals from all over the world. 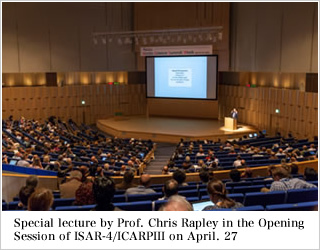 ISAR-4/ICARP III Videos are now available. Photo gallery is now available. Session report of Science Symposium ISAR-4/ICARPIII has been posted. Speech of H.I.H. Princess Takamado in the Opening Session of Science Symposium ISAR-4/ICARPIII has been posted. "Conference Statement" can be found by clicking the banner right. Now you can see abstract, meeting agenda and meeting description of the open meetings. Just click the session and meeting marks in the program at "Program" page. If you click the room number (name), you may find the presentation titles and abstract chronologically. ASSW2015 Program is now open. The latest information on Reception and Icebreaker is found at "Events / Reception and Ice-breaker". Side meeting list has been uploaded at "Events" -> "Side meetings". Registration will close on March 31. ASSW2015 4th Circular opens. Note that "Earlybird" registration will be closed on February 28. ”Time table for Shinkansen and ANA flight between Tokyo/Toyama” is added to the page "Venue and Access"
The draft of the session programs are now possible to download at "Program". It is not the final one and subject to change without notice. The draft of the eitire program of ASSW2015 is now shown at "Program"
Information for the Conference Travel Grants for Early Career Scientists is open. ASSW 3rd Circular has been modified. Call for abstracts for ISAR-4 / ICARP III Symposium will be closed Soon. Registration and Call for Abstract starts Excursions page opens. The website for ASSW2015 is open! Deadline for the application for a invitation letter needed to apply to Japanese Visa.